3 x 4" 4 x 6"
Buy More Polka Dot Organza Favor Bags Save More! 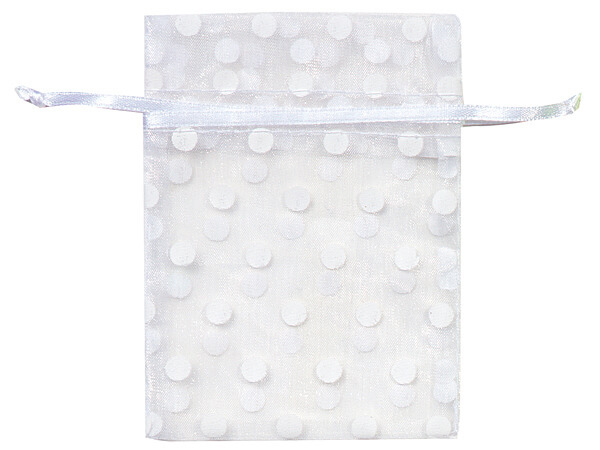 White 3x4" Organza Bags with White Polka Dots are flat sheer bags with satin drawstrings set 3/4" from the top of the bag. 100% Nylon. Polka Dot Organza Bags comes in popular colors with printed white dots. These sheer bags are ideal for basket stuffers, soaps, candles, sachets, jewelry, cosmetics, party favors and are excellent resale items. Bags are imported, 100% nylon and pvc free. Bags are hand sewn, colors and size may vary slightly from shipment to shipment.